The artist William Stephen Coleman (1829-1904) was born in Horsham in 1829. He was destined to be a physician and surgeon like his father. However, his mother came from an artistic family and William demonstrated a talent for drawing becoming a painter and illustrator. He delighted in natural history illustrating and publishing a series of books on the subject. His sister Rebecca helped him in the preparation of his woodblocks. Coleman collaborated on numerous books including British Ferns by Thomas Moore. The two volume octavo edition, shown here with two other volumes of similar interest, sold in a Toovey’s specialist book auction for £100. 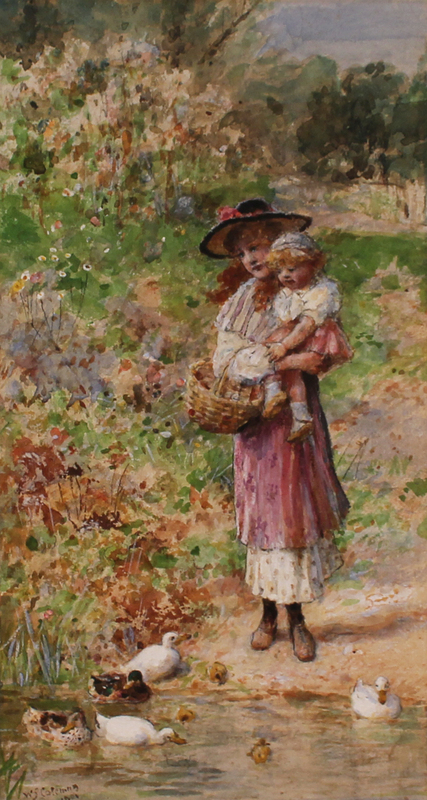 His watercolours often depict figures in landscapes in the manner of Birkett Foster. The timeless scene painted here shows a mother and child feeding ducks beside a pond. The brushwork is delicate and free. The wild flowers are picked out amongst the bracken and are framed by the copse in the distance. It realised £600 at Toovey’s recent fine picture sale. As well as landscapes Coleman also painted pretty figure subjects in the classical taste like the charming, stylized study of a cherubic child in a tree. 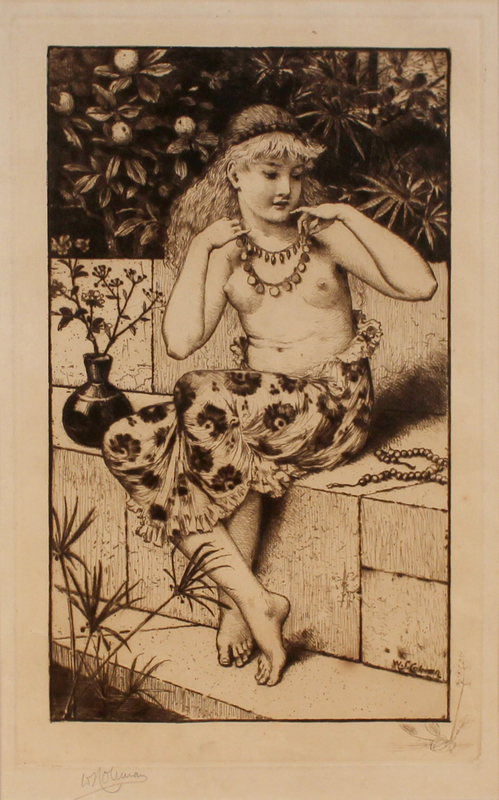 The graphic qualities of this Victorian artist and illustrator are apparent in the restricted palette and pen and ink outlines. It was sold for £300. Whilst the subject of the sepia etching is typical of the artist his prints are less sought after by today’s collectors even though they are rarer. This in part reflects the relatively conservative nature of the fine art market. Specialist dealers and collectors will always pay a premium for work that reflects what an artist is well known for. This was reflected in the £140 paid for this charming etching. William Stephen Coleman designed naturalistic decoration for the ceramic manufacturer, Minton’s. In 1871 Minton’s Art Pottery Studio was set up in Kensington Gore, London, under the direction of Coleman. Pottery and tiles were individually hand painted. The studio was short lived. It burnt down in 1875 and the devastating fire resulting in its closure. 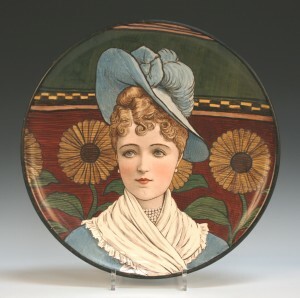 The art pottery circular charger dates from 1878 and is painted in the style of William Stephen Coleman and shows the influence of the Aesthetic Movement. The head and shoulders portrait of an elegant lady wearing a hat is brought to life by the background of sunflowers. It realised £160. Work by Victorian romantic artists like William Stephen Coleman have been out of favour but there are signs that prices might be firming and on the move. Perhaps now is the time for collectors to discover anew the qualities of these 19th century painters whilst prices remain accessible – at least for the moment! By Revd. Rupert Toovey. Originally published on 16th September 2015 in the West Sussex Gazette.